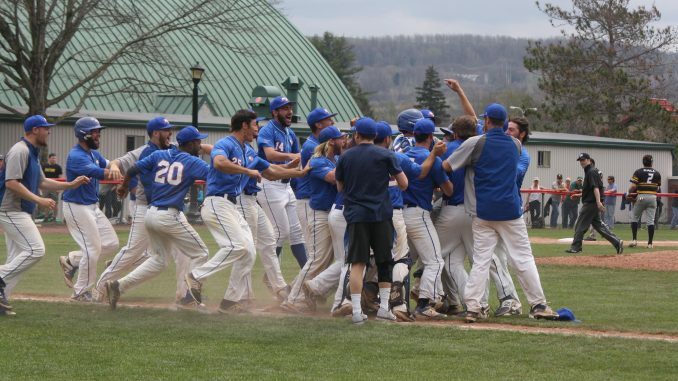 The baseball team’s season came to an end on Friday, May 4 after losing to SUNY Oswego twice in the double-elimination State University of New York Athletic Conference (SUNYAC) tournament last weekend. The Hawks ended their season at 17-18, earning their second-straight SUNYAC tournament appearance this season. New Paltz also won their first playoff game since 2001 this weekend, beating SUNY Brockport 2-1 in 11 innings. On Thursday May 3, New Paltz dropped their first game of the tournament 4-3 to SUNY Oswego. After three scoreless innings on both sides, the Hawks were able to get on the board first in the fourth inning from an RBI double by fourth-year outfielder Brian Brenton and a run on a throwing error, putting them up top 2-0. Oswego quickly answered, however, in the bottom of the inning, after an RBI single from fourth-year designated hitter Myles Kutscher and a sac-fly by fourth-year outfielder and catcher Eli Holton tied the game back up at two. A scoreless top of the fifth from New Paltz set the Lakers up to take the lead in the bottom of the inning, where third-year infielder Brandon Nicholson hit a solo-shot to put Oswego up top 3-2. The Hawks quickly tied the game up at three in the next inning with an RBI single from first-year third baseman John McCarrick. A 1-2-3 inning in the ninth from New Paltz after a scoreless seventh and eighth innings put the game in Oswego’s hands in the bottom of the inning. In the first at-bat of the inning, first-year infielder Ryan Enos put one over the fence, giving Oswego the 4-3 win. The next day, New Paltz was able to walk-off themselves against Brockport, winning 2-1 in 11 innings in a true pitchers duel. In the 11th inning of a 0-0 ball-game, the Golden Eagles were able to get on the board first on an error. With their season on the line in the bottom of the inning, third-year infielder Ryan Frost got things started with a single. A throwing error on a bunt from fourth-year outfielder Nick DiPietro put runners on second and third for fourth-year first baseman Justin Ganca. Ganca, who missed most of the 2018 campaign due to injury, hit the first pitch he saw into the outfield, scoring two and giving the Hawks the win. Donachie pitched 10.1 scoreless innings and 155 pitches, leaving the game in the 11th after the error. Second-year pitcher J.T Carroll earned the win in the decision, facing two batters, striking out one. That same day, the Hawks played Oswego for the second time of the tournament, losing 4-2 to end their season. The Lakers were able to take an early 1-0 lead in the first on a run from a throwing error. Oswego kept the scoring going in the third, when Holton hit a two-RBI single to put them up top 3-0. They would tack one more on in the fourth on a run off a wild pitch. The game was suspended in the top of the sixth due to rain. The teams would continue the next morning. New Paltz used the delay to their advantage. In the seventh inning, DiPietro knocked an RBI double and later scored on a balk to put the Hawks down by just two. 1-2-3 eighth and ninth innings proved too much, however, knocking New Paltz out of the tournament. Oswego would go on to win the 2018 SUNYAC championship. New Paltz baseball will be graduating 10 seniors this May.